As a big fan of the artwork of Yoshitoshi ABe I always look forward to any project he is involved in, and MVM have been serving me well in this regard with Serial Experiments Lain and now Haibane Renmei. As with all of the projects ABe is involved in, Haibane Renmei is definitely not the usual anime series. The story revolves around Rakka, a young girl who awakes from a cocoon in a strange land with absolutely no knowledge of her past. She has been reborn as a 'Haibane', a non-angelic being which nonetheless has a halo and wings, and must now learn to adjust to her new life in an idyllic but nameless walled town. However, she is not alone - the other Haibane who live in a large abandoned house known as Old Home are there to help her understand her new life, and teach her the customs and rules that they live by. 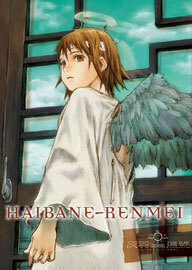 To be perfectly honest this first volume of Haibane Renmei is very difficult to explain, as not a lot really happens. The series is cleverly structured so that the viewer is slowly introduced to the world of the Haibane along with Rakka, and what a world it is. The animation, design and artwork is beautiful, with a strong use of muted and earthy colours which gives the series a halcyon and whimsical feel, and the music is understated and relaxing. As mentioned the series starts with Rakka's 'birth' from her cocoon, and the first episode follows how she is helped by Reki - a chain-smoking and rebellious looking Haibane who is nonetheless kind-hearted and supportive - through the pain of her wings growing and her initial steps into her new life. After this she receives her halo and explores the town, in the process learning about the world where Haibane are treated with kindness but are kind of second-class citizens, and how no-one is allowed to go outside the town walls. Haibane Renmei is pretty unique. It manages to let the viewer learn about its world and setting without being patronising and crucially without explaining too much. You are as much in the dark as Rakka is and this really makes you identify with the character and wonder what you will learn next and where the story is going. It has some moments of light hearted humour sprinkled through it, as well as some hints towards future potential plot elements - Rakka seems fascinated by the walls for example, and there are signs that Reki has some secrets in her past - and the scene where Rakka's wings sprout is viscerally brilliant. The press release compares Haibane Renmei with the work of Studio Ghibli, and although I never considered this before I can see why. This first volume has no real dramatic story, but it does have the whimsical and halcyon air which Studio Ghibli captures so well. It is also similar to the likes of My Neighbour Totoro in the fact that nothing really happens, but you are engrossed and entertained anyway. It is refreshing to see an anime which goes at its own pace and is thoughtful and intriguing, and Haibane Renmei is just that. It may be a bit too slow paced for some, but it's beautiful to watch and I would say that it's an essential purchase. Best Bit: Rakka's wings growing.